It's Crab-Tivating Dinners at Seasonal Tastes. Highlighting the favourite crustaceans of Singaporean, Seasonal Tastes paying the ultimate tribute by making it the highlight of the buffet every evening. The crab dishes will include Crab Steamed in Tomato Sauce with Italian Sausages, Steamed Crab with Golden Garlic, Deep-fried Crab with Salted Egg Yolk, Yellow Curry Crab, Crab with Spicy Sour Plum Sauce, Singapore Chili Crab with Mantous and Wok-fried Crab with Coriander Seeds, Bell Pepper and Onions. The best crab dish for night for me was the Crab Steamed in Tomato Sauce with Italian Sausages. The mud crab was cooked just right, fresh, sweet flesh, with a solid white wine flavour and tasty spicy Italian sausage. Chef Aaron Foster did a live demo cooking for this dish, and it was worth trying as you will not normally find this in Singapore. LittleDevil actually like their Singapore Chili Crab with Mantous, which is another must-try dish. The chilli crab gravy is solid, robust and spicy. Perfect companion for the crisp yet fluffy mantous. However, if you want to do something fusion like me, try to mix their beautiful, creamy mash potatoes with the chilli crab sauce. Let me tell you, it was just yummylicious. The live carving station was featuring Roast Pork Loin stuffed with Kimchi. Interesting combination. The meat of the pork is tender, however you hardly taste the kimchi flavour absorb into the meat. The pork skin itself was rubbery, where it can do with another 20 to 30 mins in the oven to make it crispy crackling. Cold Seafood Selection remain one of my highly anticipated station. Here you can get your fix for fresh oysters, chilled lobsters, crabs, prawns and mussels. My personal picked from this station are the oysters, lobsters and prawns. The oyster is fresh, briny with velvety texture. The lobster and prawns are solid with springy fresh texture. For dipping sauce, the wasabi mayonnaise with a dash of lemon got my pick. Health-conscious eaters are well-served with their cold cuts station, cheese and salad stations. It is basically a smorgasbord here. 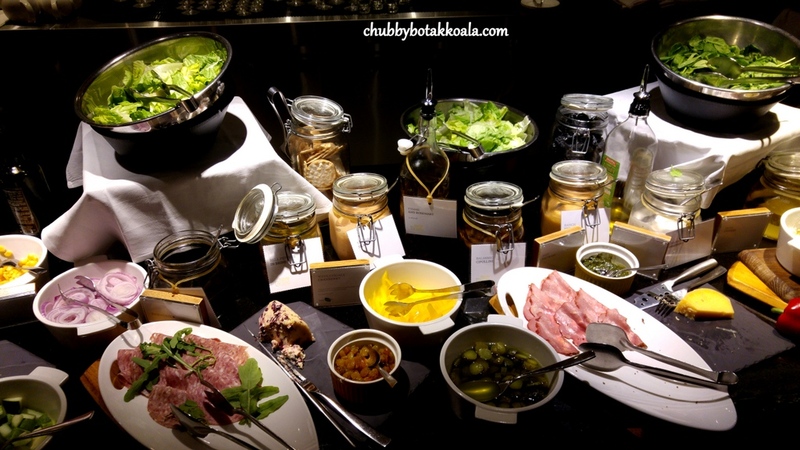 You are spoilt for choices in cold cuts, green leafs, dressing and pickles. They also combine different type of cheese here together with crackers or fruits to your liking. Across this station, there is a build-your-own Caesar salad station. The 'Live Grilling Station' will feature Lobster, Salmon Teriyaki, Tiger Prawns, Calamari and Scallop, in addition to mainstays such as Turkish Lamb Kebabs, Rosemary Beef, Pork Loin and Chili-marinated Chicken Breast on rotational basis. On the night, we had grilled calamari, chicken and pork loin. The calamari was tender yet springy, while the chicken was succulent. Both was nicely grilled with a good smokey flavour. For the pork, it was slightly too dry and tough for my taste. Nearing full capacity, I decided to go for my comfort food from the noodle station. A definitely must try here is their Thai Beef Noodle. The clear broth is robust, beefy and infused with radish. The tripe, brisket and tendon remind me of the beef noodle soup that our friends brought us in Bangkok. Yum Yum. For those who prefer local flavour, you should have their Laksa. Unlike the normal Singapore laksa, the version here is not as 'lemak' as the one we regularly ate. The flavours come from the seafood and spices, which gave the lighter soup the robustness. Finally, Desserts station. Their gelato is a must try. We were strongly recommend to try the Chocolate and Avocado. They are absolutely spot on. The dark chocolate are solid and totally yum. While the avocado is smooth, creamy with a hint of avocado flavour. For the rest of the pastries and cakes, it was good overall. It rotated on regular basis, so you hardly eat something repetitive. This time around the citrus bread and butter pudding was a perfect end to the Crab-tivating meal. Overall, it was a good dining experience to be back at Seasonal Tastes. Delicious food with wonderful scenery of panoramic view of Singapore's Marina Bay. Cheers!! When: Daily - For Dinners only from 6 p.m. – 10 p.m.
$82++ per person (Friday and Saturday). Reservations: +65.6922.6968 or email seasonaltastes.singapore@westin.com. Budget per Person: $51 - $80, $81 and above.